Gaza, Al Ray - Hamas said Wednesday that West Bank security services detained six of its members and summoned six others from several cities. 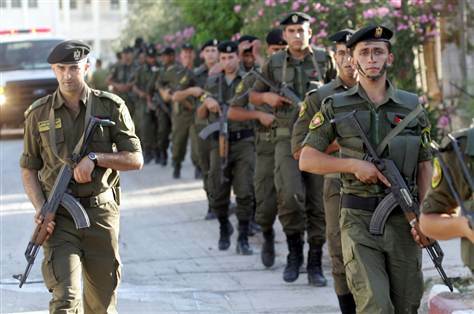 Saif Dahlah / AFP - Getty Images file Palestinian security forces patrol the West Bank town of Jenin on June 18. Gaza, Al Ray - Hamas on Wednesday said the West Bank security services detained six of its members and summoned six others from several cities. In a statement issued on West Bank, the Islamic Movement said that the Palestinian forces arrested Osama al-Sawafta and Bahaa Ghalion from Tubas, and Ramadan al-Hash'lamon from Hebron, in addion to Ahmad Rayan and brothers Zakaria and Mohammed Hashaikah from Ramallah. While the forces summoned Mohamed al-Nat'sha, Baraa Erziqat and Muhannad al-Rabay from Hebron, and Khaled Sleem, Orabi al-Jawarish and Abdul-Mahdi al-Zohour from Bethlehem, the statement added. Sawafta, Erziqat and Sleem are ex-prisoners who spent many year in the Israeli prisons. Sawafta has started a hunger strike to protest his detention by the forces, according to the statement. In this respect, Hassan Fasfoos, one of the active Fatah resistance fighters previously detained by the Preventive Service and is held in Hebron prison, was reportedly transferred to a public hospital as he was beaten and tortured him. The Palestinian security campaign came days after Palestinian rivals Hamas and Fatah effectively ended a seven-year-long rift, with the agreement on a consensus government announced by President Abbas on June 2.